"British Prime Minister, 1937-1940. Most remembered for his ill-advised policy of appeasement toward Nazi Germany prior to World War II, resulting in the Munich Pact of 1938. " Arthur Neville Chamberlain was born on March 8, 1869 in Birmingham. He was educated there and became mayor in 1915. Elected to Parliament in 1918, he then held a series of public posts, such as postmaster general, minister of health, and chancellor of the Exchequer. 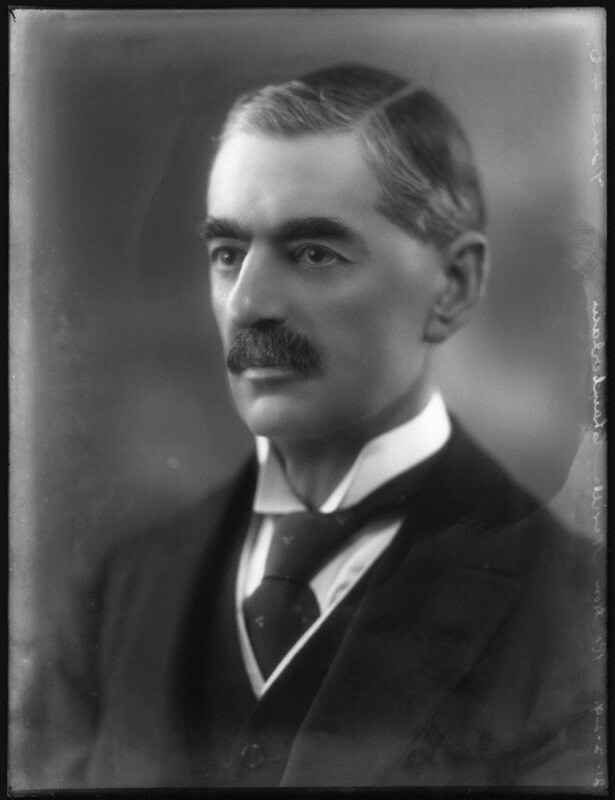 In 1937, Chamberlain became Prime Minister. His major goal seemed to be the prevention of a war in Europe. He practiced a policy of appeasement toward Germany that resulted in the Munich Pact, signed in September of 1938. As a result of the pact, Czechoslovakia was forced to cede the Sudetenland, a part of Czechoslovakia with a large ethnic German population, to Germany without compensation. Chamberlain eventually realized that his policy was a failure. When Poland was threatened the following year, he vowed British support. When Hitler invaded Poland, Chamberlain and Great Britain declared war on Germany. Due primarily to the debacles of the first months of the war, Chamberlain was forced to resign as Prime Minister in May of 1940. He did, however, remain in Churchill's cabinet as lord president of the council. Illness forced his resignation from the government in October, 1940. He died soon after, on November 9th.